JNN 21 Mar 2014 Cairo : Ten people were killed in violence across Egypt on Wednesday, months ahead of a presidential vote meant to put Egypt back on a democratic path after last July’s army takeover. At least three students have reportedly been killed after Egyptian security guards attacked anti-government protest rallies in several cities across the North African country. At least two Egyptian army officers have been killed in clashes with militants in north of the capital, Cairo. 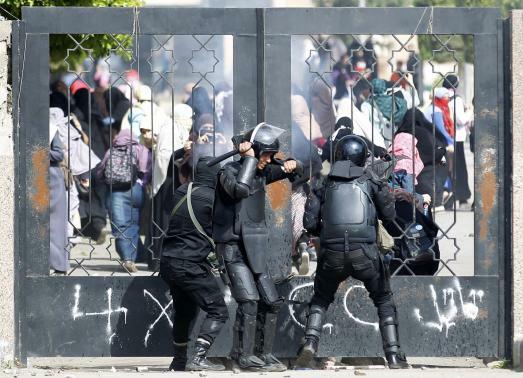 According to reports, Egyptian riot police fired tear gas and birdshots to break up the anti-government demonstrations held in several university campuses across Egypt, including the campus of al-Azhar University in the capital, Cairo, on Wednesday. During the protests, the Egyptian students called for the reinstatement of the country’s first democratically-elected president, Mohamed Morsi, who had been deposed by the military in July last year. Reports further said Egyptian security forces arrested a number of pro-Morsi students participating in the demonstrations, as the military-installed government continues its clampdown on dissent. Earlier on Wednesday, government forces also broke up a similar protest rally in Egypt’s northern Delta province of Damietta. According to Press TV, the officers were shot dead by militants during a police raid on their hideout near the Nile Delta town al-Qanatir al-Khayriya on Wednesday. Some 200 policemen and soldiers have been killed by militants in bombings and shootings since the army ousted president Mohamed Morsi. On March 15, armed assailants shot dead six soldiers at a military checkpoint in Cairo’s northern neighborhood of Shubra al-Kheima. Egypt has been experiencing unrelenting violence since the country’s former president was ousted. Hundreds have lost their lives in the ensuing violence across the country. This entry was posted in AFRICA and tagged Cairo, Egypt, Jama Al Azhar, MB, Mohamed Morsi, Muslim Brotherhood, Protesters, Violence. Bookmark the permalink.